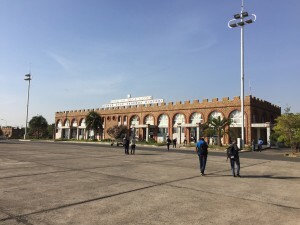 Today began with a flight from Addis Ababa to Gondar, where we were slated to meet with our many friends at the University of Gondar about Dr. Gebreyes’ iPad launch and messaging related to rabies. Our 10 a.m. meeting soon turned into a 2 p.m. meeting, since my 8 a.m. flight became a 12:30 p.m. flight. 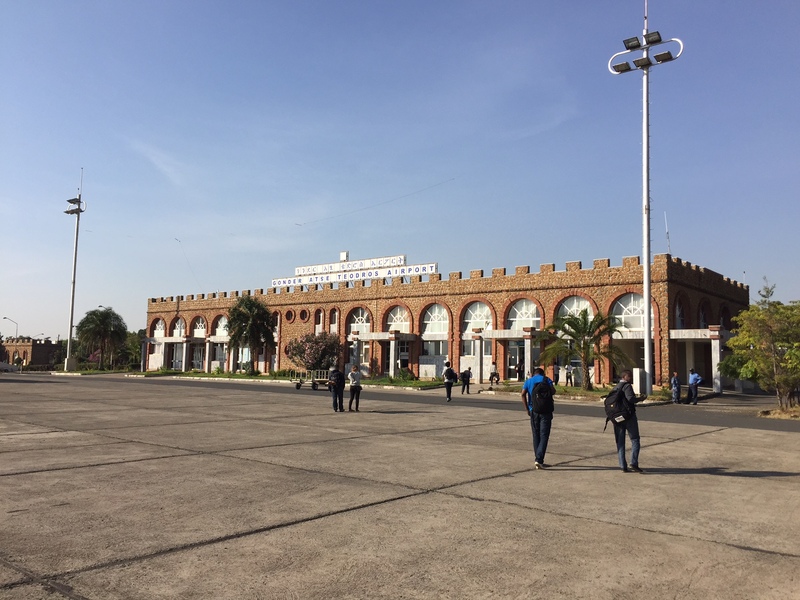 One of the most striking parts of the day was the arrival at the Gondar airport, which looked like a small-town auditorium in the middle of the old west. The drive to the university continued to overwhelm our senses, as we saw wagons as plentiful as Toyotas in America, each drawn by a scrawny-necked pony-sized equine. There were market stalls lining the roads, as dozens of people walked hither and yon. And when they were not walking, we saw something we almost never see in America: people sitting still, not working a phone, not reading, and just being. Once we made it to the university, we met for about an hour to introduce ourselves and get our plan in motion before embarking on a campus tour that showed incredible technological advancements that existed amid the economic challenges that are Ethiopia. Our first stop was to see the data center that handle the university’s computer infrastructure, and it was truly impressive scope and forethought. They have 172 terabytes of storage being backed up every night. They are challenged, however, by the nationwide infrastructure, which can slow their Internet to a crawl outside the campus. We next toured the campus, complete with a visit to an overcrowded computer lab, the library and a tech-centered classroom that featured state-of-the-art lecture capture. Distance education is a goal, but everyone acknowledged that greater Internet capacity would be needed to expand course offerings beyond campus boundaries. But what amazing boundaries the campus had–breathtaking mountain views, with students milling on every street and throughout every building. 224 steps and we walked every one! 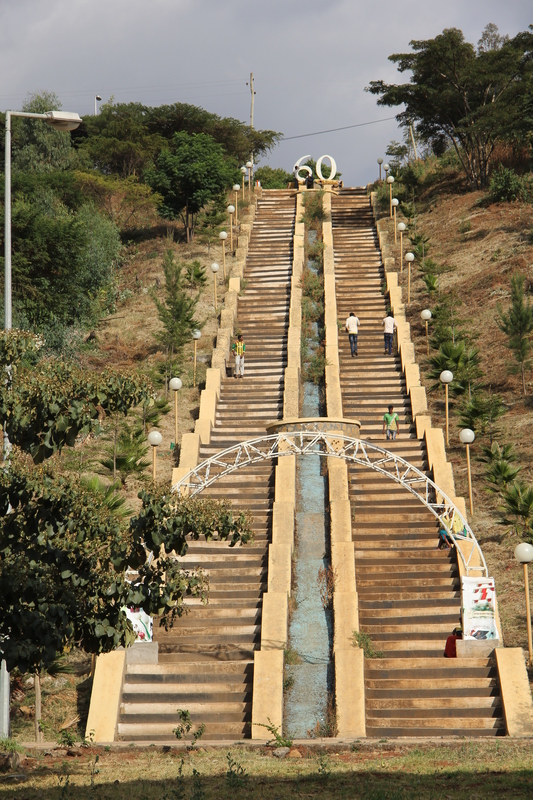 Like any good member of the University of Gondar, we walked the 224 steps to the area called Maraki, which means “charming” in the Ethiopian language of Amharic. We even engaged in a quick game of Frisbee, but short when our flying disk flew down the side of the hill. 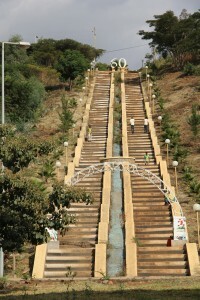 We capped of with dinner at Goha, offering a magnificent hilltop view of Gondar–uncluttered by high rise or any light noise–before the time difference found us all closing out the night in our hotel lobby, glued to our computers as email flooded in during U.S. work hours. Tomorrow, we are all business–rabies education and messaging, iPad instruction, course launching, before we dine with the university’s vice president. So much to do, so little time. Posted by Nicole Kraft at 3:01pm December 8, 2014 Posted in Uncategorized. Bookmark the permalink.